Money Concepts Celebrates Its 35th Anniversary as an Independent Wealth Management and Financial Planning Firm. The John P Walsh Award Was Presented to James B. Moss. The John P. Walsh Award was presented to James B. Moss, CEP®, RFC® in recognition of his unwavering determination to the expansion of the financial planning industry, his dedication to the elevation of the profession and his commitment to the help and support of his peers. His leadership and integrity are an inspiration to us all. 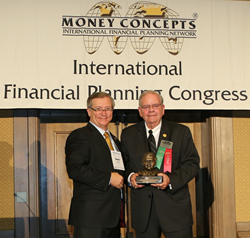 Money Concepts recognized many award winners during their recent Financial Planning Congress celebrating their 35th Anniversary. A special award named after founder John P. Walsh was presented to James B. Moss from Indianapolis, IN. Mr. Moss joined Money Concepts in 1980 and has served as Regional Director. He has committed his career to helping advisors through training, education and developing professional skills needed to effectively serve their clients. In 1979 industry legend Jack Walsh recognized investors were in need of a new way to access financial services and traditional insurance agents; brokers and financial advisors needed a new way to deliver these services. His entrepreneurial spirit and vision resulted in the creation of Money Concepts. The John P. Walsh Award was presented to James B Moss, CEP®, RFC® from Indianapolis, Indiana. Money Concepts Capital Corp. is a privately-owned independent broker-dealer and dually registered as a Registered Investment Advisor based in Palm Beach Gardens, FL. Established in 1979, and its parent company Money Concepts International, Inc. has a network of approximately 700 financial professional’s centers nationwide. For more information, visit http://www.MoneyConcepts.com/Advisor and follow us on Facebook, LinkedIn and Twitter.